Overlooking the Torrey Pines Golf Course and the Pacific Ocean, this beautiful hotel sits between La Jolla and Del Mar. The hotel's 394 rooms offer views of the golf course, gardens and the Pacific horizon. Guests can relax at the spa or the heated pool, and enjoy a game of tennis. The hotel offers easy access to many popular attractions including SeaWorld, Del Mar Racetrack, Birch Aquarium, and Mission Bay. 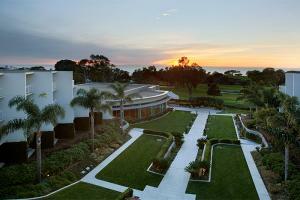 Located in La Jolla, California, about 15 miles from San Diego International-Lindbergh Field.